This USB flash drive is for the geeks like me that still remember floppy disks and never want to forget. The 3.5 inch floppy disk could hold like 1.44MB and the flash drive it is pictured on comes in many sizes al the way up to 64GB and USB 3.0 so that you can get a super fast replacement for that really old floppy disk. The USB flash drive on the picture is black but it is available in many fun color all with the same color metal swivel sleeve that has a little loop on top so that you can hang it on your key chain or maybe a necklace. 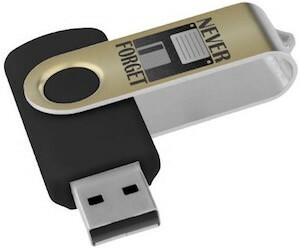 Come check out this fun Never Forget The Floppy Disk USB Flash Drive.